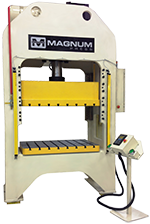 Standard RAM uses self-aligning flange end for tooling connection with split ring die coupler or quick change die coupler. For some operations post guided tool plates can eliminate the need for a die set. 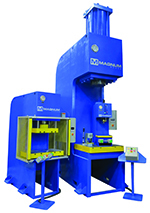 Two-post hydraulic presses are typically well suited for dies that are wide left to right and narrower front to back. 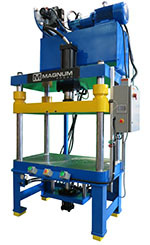 The four-post press is better suited for larger dies or operations requiring side access to die such as material feed. 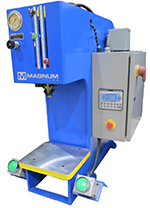 Off-the- shelf self-lubricating and replaceable bronze gib material make the press suited to tough applications. ix-point bearing contact with adjustment bolts compensates for wear. Contact us today. 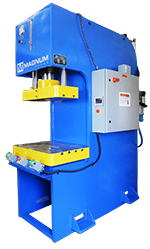 Let us perform an on-site evaluation to help you determine the right small-tonnage hydraulic press solution for you.